Anoop Mathur is the Founder and President of CORE Media (Centre of Recognition and Excellence). CORE Media is a multi-platform new-age niche media company that owns and operates proprietary marketing event brands in India with a focus on ICT Enterprises, CIO Community and Technology Startups. Some of its flagship properties include CIO Choice, CIO Power List, CIO Crown, and Hot 100: Race to Grace Awards. Anoop is also an angel investor in some of India’s most promising startups and the founder of CIO Angel Network whose mission is to accelerate seed stage startups through fundraising support and customer discovery. 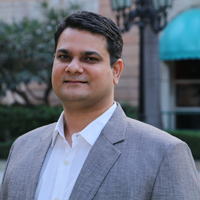 Prior to founding CORE Media Anoop was the Chairman and Managing Director of Pacific & Strategic Media (PSG – India), a niche and leading media company specialising in the ICT domain. In this capacity, Anoop had the P&L responsibility for India and Middle East operations. Through his extensive professional experience in the Healthcare, Insurance, Financial Services, BPO and IT Enabled Services business verticals, he has held senior positions with leading global organisations such as Prudential, Capita, ICICI OneSource, and United Healthcare. Prior to joining the corporate business environment, Anoop was engaged in providing C&F services to the Government and State Trading Corporation of India.